It's all about you. Understand how you move, or don't, so you can live better. Track all-day activity, monitor sleep time and quality. Pair with your smartphone to get texts on your wrist, set goals and discover patterns to turn insight in to action. 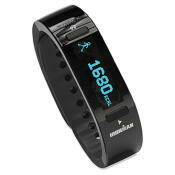 Keep yourself moving, track steps, distance and calories burned. Set goals on your smartphone and follow your improvement. It's the most important thing, but none of us get enough. Track how well and how long you sleep. Time your workouts and view real-time distance, pace and more. Keep life moving and see who's trying to get in touch, right on your wrist.